A brick crosswalk on Washington Street in Brookline is one of several improvements to make it easier for people to access different parts of the Emerald Necklace. BROOKLINE — Leverett Pond comes to a point just south of Route 9, and the Emerald Necklace narrows along with it, becoming vanishingly thin as the string of parks meets the major thoroughfare that has been one of its most intractable interruptions. For years, only a small gap in the median strip beckoned walkers and bikers to traverse the traffic and continue along the Muddy River toward the Fenway. But now, a red-brick crosswalk and a new stoplight are there to negotiate between drivers and people using the park system. The improvement, years in the making, is one of a handful of projects intended to reconnect broken links in the Emerald Necklace, which was designed in the 19th century by Frederick Law Olmsted, then broken into pieces over decades as planners made room for cars. On April 21, nearby Boston will celebrate the opening of Justine Mee Liff Park, where the exposed Muddy River now flows through a space that was once a parking lot. The project, named for the parks commissioner who died in 2002, also changed the traffic pattern with an eye toward improving accessibility. At Charlesgate, the state is looking to create a path from the Back Bay Fens onto the Esplanade. And at Forest Hills, transportation workers are forging a long-missing connection between the Arnold Arboretum and Franklin Park. Karen Mauney-Brodek, who took over last year as president of the Emerald Necklace Conservancy, said projects like the park further the organization’s work to promote an interconnected system rather than a series of loosely related spaces. “These improvements are trying to knit back the links in the chain of the necklace for pedestrians, joggers, bikers, parents with strollers — anyone who wants to explore the necklace and travel through our city and our parks without a car,” she said in an interview. Of course, there is plenty of work left to do to strengthen the bonds of the necklace. The Arborway remains a confusing pedestrian environment between the Arboretum and Jamaica Pond, for instance — though the state Department of Conservation and Recreation is studying ways to fix it. And some pedestrian advocates complain that many of the parks are hard to reach without crossing harrowing intersections, some of which do not have ramps for people who use wheelchairs. Even at the brand new Liff park, there have been complaints that the sidewalks are not wide enough, that there isn’t dedicated space for bikes, and that the timing of the walk signals is off. Boston Cyclists Union executive director Rebecca Wolfson said some of that back-and-forth is a product of increased interest in commuting without a car. There are many considerations that go into the planning of anything along the Emerald Necklace. Two municipalities, state agencies, federal officials, and private landowners control property around the parks. 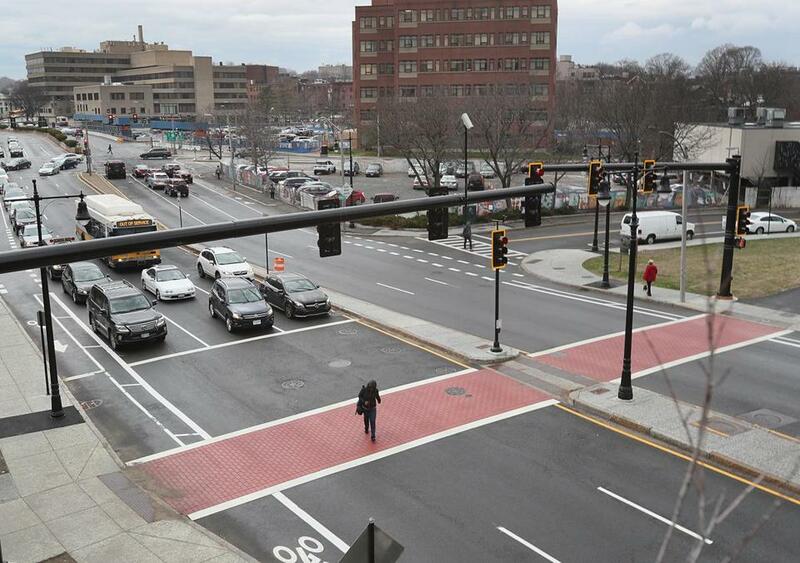 Bikers and pedestrians now have a louder voice, but the parks also border some of Boston’s important traffic arteries. That’s not to mention flood control along the Muddy River, one of the original reasons for the parks and a catalyst for the recent efforts. The US Army Corps of Engineers agreed to work with Boston, Brookline, and the state on the $61 million restoration project that resulted in the creation of the park after a 1996 flood that caused close to $70 million in property damage. The new layout is designed to handle rising waters without overflowing. That event also helped lead to the 1998 creation of the conservancy, which promotes the Emerald Necklace and coordinates efforts along its more than 7-mile route. A decade later, the system is addressing some of its most persistent gaps. The demolition of the Casey Overpass in Jamaica Plain is part of an estimated $74 million project to create a tree-lined boulevard with safer crossings and space for pedestrians and bicyclists. The state Department of Transportation says it will connect the Arboretum and Franklin Park with the separate Southwest Corridor Park. At Charlesgate, the conservation department is moving forward with a plan to connect the Fens with a little-used area that connects to the shore of the Charles River. Smaller projects, like a redesign of the intersection between Perkins Street and Francis Parkman Drive at the edge of Jamaica Pond, are also planned. Mayor Martin J. Walsh recently announced a capital budget that includes millions for work on the pathways at the pond and in Franklin Park. There will always be disagreement and negotiation over the competing needs of drivers and pedestrians, but advocates for bicyclists and walkers say the recent changes represent a generational shift in how residents and leaders think about parks. Jeffrey Ferris, owner of Ferris Wheels Bike Shop in Jamaica Plain, remembers being one of a few bicyclists speaking out. He arrived at a recent meeting on the Perkins Street project to see a dozen bikes outside. And though he opposed the Casey demolition, and has thoughts about how the Route 9 project in Brookline could have been better, he also remembers the time when he and a friend carried asphalt into the street to create their own bike ramps at the crossing. 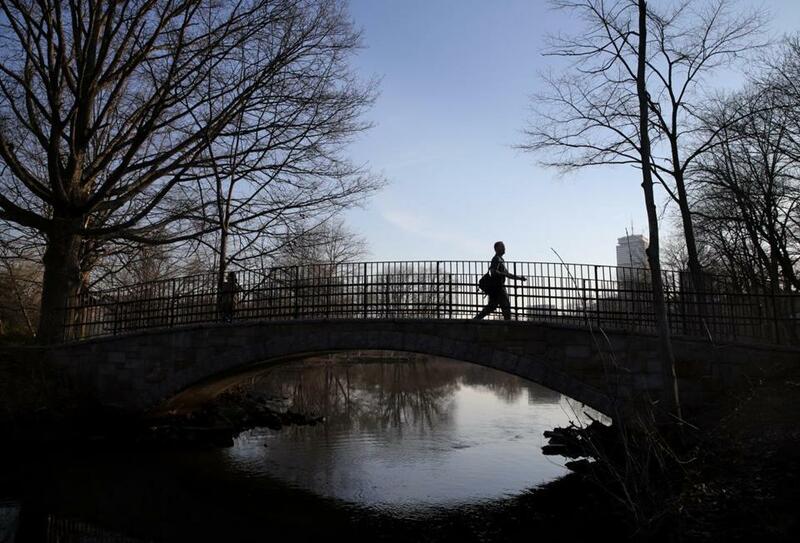 A pedestrian crossed a bridge over the Muddy River. A previous version of this story contained an incorrect photo caption describing the community where a new pedestrian crossing is located.